Concieved as an extension of the existing boardwalk, the Wind Breaker provides refuge from the harsh winter winds as visitors meander down its gravel path. Inspired by the horizontality of the landscape and existing site fence, the windbreaker gradually rises out of the landscape to obscure one`s view of the lifeguard stand #2. Upon discovering and ascending the structure, one is rewarded with a panoramic view of the frozen lake and city beyond. Reclaimed railway ties bolted to sand anchors allow for easy installation and removal, while minimally disturbing the beach landscape. 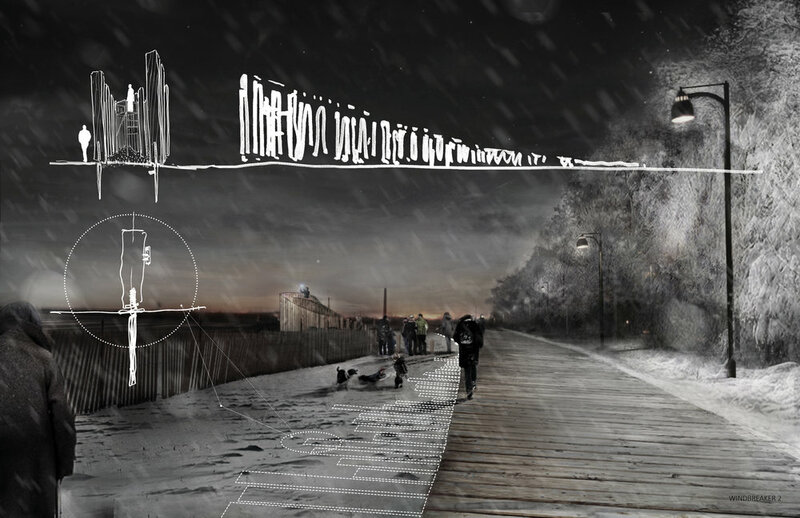 After decomissioning, the railway ties can be laid horizontally and integrated into the existing boardwalk, furthering pedestrian enjoyment of the Beaches lakefront.